Sgt. 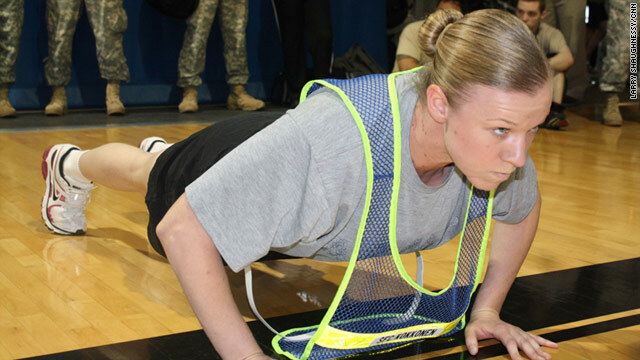 1st Class Amanda Kokkonen performs pushups for the new test without resting and without changing hand positions. Washington (CNN) -- In the 21st-century Army, sit-ups have gone the way of bazookas. Soldiers will soon find themselves doing "rowers." It's part of the Army's effort to update its old Physical Fitness Test and replace it with the Army Physical Readiness Test. The old test has been in place since 1980, and it included three events: a two-mile run, two minutes of push-ups and two minutes of sit-ups. "We thought we had the right test," said Maj. Gen. Richard Longo, an Army training official. But after nearly 10 years of war, the Army found the old test didn't help prepare a soldier for combat. Now it has a new five-exercise test that is "targeted at the warrior on the battlefield," Longo said at a demonstration Thursday inside the Pentagon Athletic Center. It's similar to "suicides" that sports teams use, but it's harder to cut corners. A soldier runs five yards, picks up a wooden block and runs back, puts the block on the starting line, repeats that over a 10-yard, then 15-yard distance. In total the soldier runs 60 yards. The blocks are used to make sure soldiers don't cut corners. They have to put them down on the starting line for it to count. The run tests a soldier's lower body muscles and his or her ability to move quickly. It's the same thing you did in gym class. The Army will use it to test lower body strength. For troops required to carry packs often weighing as much as 75 pounds, strong legs are crucial. These replace sit-ups. Your arms start out flat on the floor straight above your head. You keep your knees bent and feet together, flat on the ground. Then you sit up, bringing your arms next to your knees parallel to the ground. "It's harder than a sit-up," Longo said, because no one is holding your feet down as in the old test. But it's less stressful on your back and does more to build you upper and lower abdominal muscles. Longo said a soldier carrying gear over a brick fence needs strong abdominal muscles to get over the wall quickly and safely. This new test requires the soldier to keep his or her hands planted in one place aligned with the shoulders. And once the timing starts, you can't move your hands or stop to rest as you could in the old test. One soldier who was part of Thursday's demonstration did 29 in a row before collapsing just before her minute was up. Sgt. 1st Class Amanda Kokkonen of Big Bear, California, said the old test would give her a sore neck and upper back because she would change hand positions. Now with the new test requiring that she not move her hands, she said she can feel the stress on her biceps and triceps. The Army reduced the run from two miles because while most of the dozens of soldiers watching the demonstration had been in combat, none had said he or she ever had to run even a mile on the battlefield. And 1.5 miles is ideal for measuring a soldier's cardiovascular health and stamina, according to Army fitness experts. The Army admits that these events are not always the ideal tests of physical fitness, but the most practical for armed forces spread out over the globe. For example, Longo said a pull-up is the best way to test upper body strength. But that would mean buying a set of pull-up bars for every Army base, training center and outpost around the world. These tests require only some wooden blocks for the shuttle run and a measuring tape for the long jump. But they aren't easy. Sgt. 1st Class David Rispress of Columbus, Ohio, is an Army trainer and has been doing the new test for months. But when it was over, even though he did only three of the five events, his Army T-shirt was soaked in sweat. The next phase of the Army's plan to replace the old test is to have 10,000 soldiers of all ages, men and women, do the new test in coming weeks. From that, fitness experts will build a set of standards that all soldiers throughout the Army will have to meet. Those standards may vary depending on gender, age and even height. The bottom line: The Army hopes that when soldiers go into battle, they're more fit to fight. "When you train for this test," Longo said, "now you are training for combat."